Bill Gates has called Paul Farmer one of the most amazing people he has ever met. CNN medical correspondent Dr. Sanjay Gupta says that "if pure altruism exists in humans, it probably looks a lot like Dr. Paul Farmer." 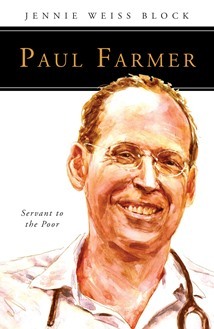 In Paul Farmer, Servant to the Poor, Jennie Weiss Block introduces readers to this physician and medical anthropologist of international stature whose Catholic faith has driven him to work untiringly to make a preferential option for the poor in health care. Farmer, with his colleagues at Harvard University and Partners In Health, has been instrumental in bringing the fruits of modern medicine to millions of the poorest people in the world, in places like Haiti, Rwanda, Peru, Russia, Malawi, and West Africa during the recent Ebola crisis. Challenging the conventional wisdom of global health experts, Dr. Farmer has shown it is possible to deliver high-quality medical care on a large scale in settings of great poverty and to build communities around the globe where good health and hope prevail. Jennie Weiss Block, OP, is a Dominican laywoman, a practical theologian, and an author who has taught theology and lectured widely on theological topics. She is coeditor of In the Company of the Poor: Conversations with Dr. Paul Farmer and Fr. Gustavo Gutiérrez (Orbis Books, 2013) and wrote a chapter of Haiti after the Earthquake (Public Affairs, 2011). Her book Copious Hosting: A Theology of Access for People with Disabilities (Continuum, 2002) is considered a seminal text in disability theology. She has served as chief adviser to Dr. Paul Farmer since 2009 and was his chief of staff in his role as United Nations deputy special envoy under President Bill Clinton. Some say that the devil is in the details, but in the life of Paul Farmer, there's grace in those details! Whether he's living in Haiti, Liberia, Rwanda, or Cambridge, channeling the corporal works into weapons of mass salvation, or running with the preferential option for the poor, Paul's life exudes the call that's so tangible in these pages. His friend and spiritual adviser, Jennie Weiss Block captures it all in her compelling account when she asks us, "How do you say no to someone who takes the Gospel so seriously?" Read this beautiful book and see if you too don't find yourself saying, "Yes!" Paul Farmer is one of the most extraordinary people I have ever met. A brilliant doctor and teacher, he tirelessly works for the poorest of the poor, insisting that they deserve the very best care that is available. He not only changes individual lives, but massive systems, proving against overwhelming objections that his methods are not only what Christian compassion demands, but that they bring about effective cures. Jennie Weiss Block will make you fall in love not only with Paul, but with the beloved people to whom he is so passionately committed. This is not a book you can put back on the shelf after reading; it will move you to take the next step in your own commitment to accompany the poorest in our world. In Jennie Block's beautiful book, she illuminates Paul Farmer's life as one driven by a deep anger at deadly injustices and an equally deep conviction that imagination and commitment can make the future healthier, more just and more equal. In these pages, Jennie elucidates how closely linked Paul's faith is to both his anger and his hope. Paul Farmer: Servant to the Poor is a timely and timeless inspirational read about how and why one man has never relinquished his belief that the world can be better, while along the way saving and improving countless lives. It is rare that readers get to explore the lives of legendary people while they are still with us making this book a precious gift. One of the greatest physician-scholar-activist servants in American history, Paul Farmer is a powerful model of service to the poor. The world has much to learn from his life and witness. For anyone with a heart for the vulnerable, the poor and the underserved, this thoughtful new text about an extraordinary human being is an inspiration and must read.